I was reading recently about endurance swimmer Diana Nyad’s feat of becoming the first person to swim from Cuba to Florida. The physical details of what she went through are mind-boggling, but what struck me also was the psychological element. It reminded me that certain mind games can be very useful in reaching long-term goals, and there are some examples that might be effective when it comes to saving for retirement. Nyad had to brave sharks, stinging jellyfish, and turbulent seas as she swam the 110 miles from Cuba to Florida in just shy of 53 hours. That would be an extraordinary physical accomplishment for anyone, but what adds another dimension to Nyad’s feat is that she is 64 years old. Significantly, she cited her age as a strength rather than a weakness because it gave her the right mental approach to allow her to keep going through hours of extreme physical hardship. Retirement saving is a form of endurance challenge. It won’t tax you physically, but it will test your will power over decades of temptations to save less and spend more now. There are no sharks or stinging jelly fish, but there are investment setbacks and judgment errors that will take pieces out of your portfolio along the way. Like Diana Nyad, you will be helped greatly in going the distance if you get pretty good at the right kind of mind games. Monitor projected income, not asset value. People tend to monitor their progress toward a retirement goal of a certain asset value they need to accumulate, and that can create two problems. First of all, it can make your goal seem impossibly far away, as when you’ve accumulated $30, 000 and need to get to $1 million. Second, that asset value becomes a temptation. There will no doubt be many things you could use that $30, 000 for now; and since retirement is so far off, why not spend a little of those hard-earned savings…. Instead of watching your asset value, run that asset figure through a retirement calculator and see how much income it would support in retirement. This way, it won’t give the illusion that you have a nice chunk of accumulated wealth at your disposal, and it will keep you focused on a very candid view of what kind of retirement standard of living you are facing if you don’t continue to save. The circuit-breaker. As you start to build up a decent retirement balance, you can get sucked into getting too excited when your investments are up and too frustrated when they are down. These emotional swings can be bad for retirement savings — counting your gains too soon can lead you to skimp on the next year’s contributions, while getting discouraged can cause you to abandon your retirement goals altogether. The best thing to do the next time you have a good year is build in the assumption that you are going to lose 10 or 15 percent next year. This will keep your retirement projections from getting too far ahead of themselves, and help you take setbacks more in stride. I’ve done this over the past few years, and it has been very effective in keeping my emotions on an even keel throughout the stock market’s ups and downs. The “401(k) or paycheck” comparison. When you are struggling to stretch your paycheck, it can seem like a shame to peel off a portion of it every week to go into your retirement fund, but what can help is a side-by-side comparison of what that money looks like going into the retirement fund vs. into your pocket. Let’s say you make $60, 000 a year, pay about 20 percent in taxes, and have an employer-sponsored 401(k) plan with a 50 percent match on the first 5 percent of salary deferred. If you defer 10 percent of salary to the plan, that would be $6, 000 with no taxes taken out, plus another $1, 500 from the employer match for a total value of $7, 500. If instead you take that $6, 000 straight into your paycheck, you’ll get $1, 200 in taxes taken off the top with no employer match added, for a total value of $4, 800. Thinking of this as a choice between $7, 500 and $4, 800 makes it easier to defer money to the retirement plan. Look at mistakes as tools to build with. Back to Diana Nyad for a second — she succeeded in her Cuba-to-Florida swim on her fifth try, having failed four times previously. Instead of giving up, she just incorporated lessons from her past attempts into her successful try. Whatever mistakes you make with your retirement savings, let them make your future efforts that much stronger. So, look out for the sharks, and prepare yourself for a long journey. Like any accomplishment, the difficulty of saving for retirement will make it all the more rewarding when you get it done. 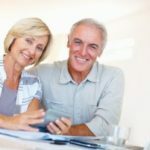 Projecting income and saving for retirement is great but what about those like myself and my husband, where at age 54 and 72, we have been blessed enough to pay the bare necessities but do not have any retirement money saved because there is no excess to save? Great article, until recently I was more obsessed with asset valuation compared to future projection. After reading up about it more from excellent personal finance sites I’ve come to realize how important it is and am slowly but sure changing my attitude towards investing. Great post, thanks for sharing. Projected income is so important! when we retire we need to take into account inflation, $1000 now will probably be worth $400 in 30 years time so we need to save, save save and not look at asset value but future projections, I’ve been banging on about this and it’s nice to see someone else who thinks this way. Great post, thanks for sharing. Personally, I tend to look at income derived from an asset and the future income that will be derived from it. If the increase in investment income matches or exceeds inflation then I’m happy. I have property in London and the income in terms of rent has increased in line with inflation, as long as this happens I’m happy to leave the investment as it is. Good Article, gave me some things to ponder about. In your Retirement Savings Mind Game #3 – You reference that the income is ‘deferred’. What you fail to mention is that this money will be taxed in the future. Even if the person dies and leaves it to a spouse or child – It will be Taxed. Not only will it be taxed but it will be taxed at the attained tax rate. Most people intend on retiring with a similar lifestyle as when they were in their working years. So in your scenario the person is deferring a known tax today for an unknown tax calculation and rate in the future. Taxes have just gone up in January. In fact it was the largest tax increase in history. Although we have no idea what the future holds – Historically we are more than 20% under the average tax rate since its inception in 1913 – when the top rate was 7%. So – in your scenario – the person intends on failing at life and having less income in retirement – therefore being in a lower tax bracket than when they deferred the tax in their accumulation years. And this assumes that tax rates stay the same as they are today. Seems like that strategy is built on a lot of Hope and not on sound financial advice. Good point Donny – when you look at how dividends came through the 2008/2009 market decline, they were remarkably stable, especially compared to stock prices. They also don’t typically rise as fast as prices during market rallies, so focusing on income production also would help people avoid getting too optimistic at market peaks.